presents the complete new portfolio of the new generation Modern Premium products to Indian customers. 2015 Elantra promises to create a new benchmark and strives to set a high standard of premium for its class in India with its modern aesthetic design, high-class interiors and cutting-edge technology. Its features include exemplary safety and high efficiency, while boasting of sporty and agile handling. The efficient and high-performance engineering incorporated in Elantra delivers a higher level of driving pleasure. "The Elantra has always been the trendsetter in its segment and is now set to offer high standard in the premium segment. 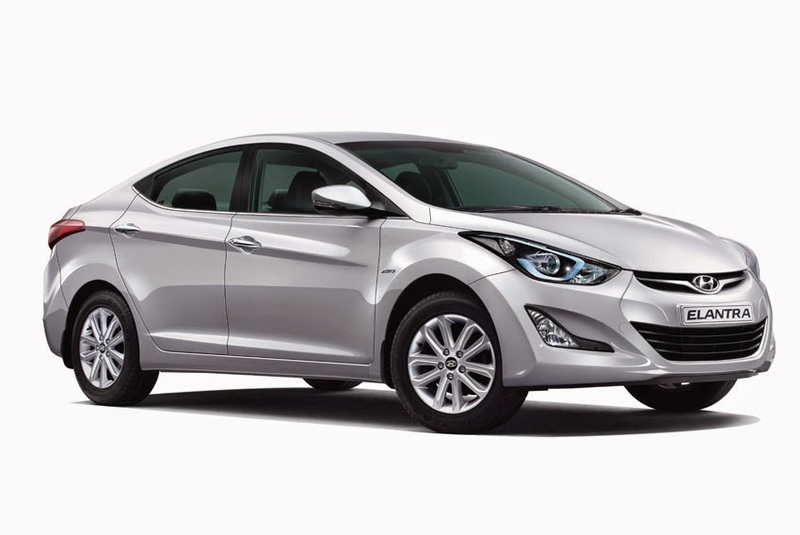 The 2015 Elantra will delight our customers with its high-class appeal and agility. Elantra being a global model is Hyundai's first car and one of only 10 cars in the history of the auto industry to reach over 10-million sales globally. Designed in line with a vision of creating cutting edge driving innovations and delivering outstanding comfort features, the new Elantra is engineered for excellence to cater to various needs of the customers." said B.S. Seo, Managing Director & CEO, HMIL. The Elantra features a 'wind craft' design inspired by nature's contours, dynamic curl of an ocean wave, flowing lines of canyon walls. Called as 'fluidic sculpture', the Elantra continues this design philosophy that injects sophistication and dynamic angles into the shape of a vehicle. The sleek dynamic lines and deep grooves create a modern and futuristic look. The 2015 Elantra portrays a truly modern design philosophy through its distinctive exterior styling. Evoking a premium feel, the design cues display the Hyundai family aesthetics, featuring a striking hexagonal radiator grille. Sleek lines flow from front to rear with a sporty profile and dynamic rear end. The newly-designed stylish bold front bumper and the grille depicted in chrome, as well as adoption of projector headlamps with LED light guide and trendy fog lamps adds a dynamic and high-tech feel to the 2015 Elantra. The 2015 Elantra's premium interior comes with host of segment-first features. The High-tech elements and sportiness strikes the best sense of the luxury. With exciting flowing shapes and high-grade materials interprets contemporary premiumness of the car. 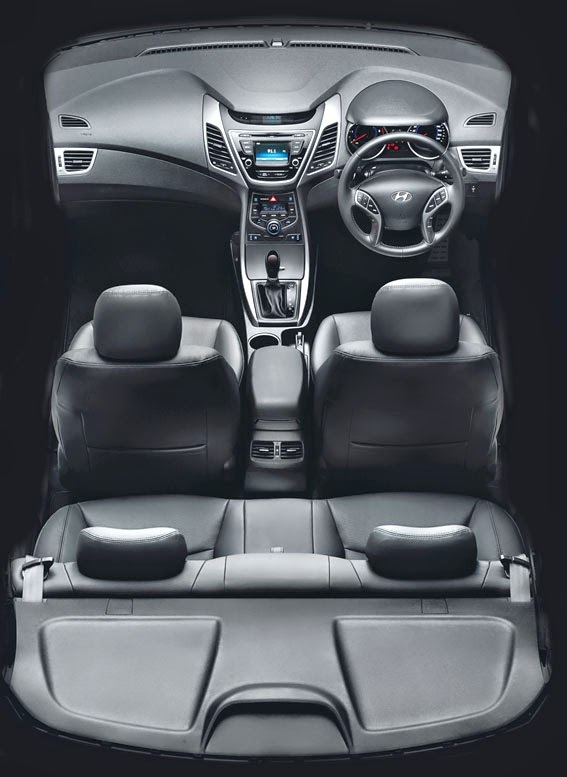 The new Elantra seats feature comfortable upholstery and ergonomic contours. Attractive seats covered in full leather exude modernity. The spacious cabins & innovative features that blend perfectly with the exteriors, have been designed to create an environment of breath-taking refinement, while the lines on the interiors of the doors give the Elantra a premium appeal. The interior skilfully combines a newly interpreted, sporty and flowing centre console design. The sportily designed, width-emphasising dashboard, newly integrated control and display system represents the modern premium philosophy. The multimedia system combines entertainment, information and communication: The new generation audio features now an entirely new designed user interface and graphics, 4.3-inch colour TFT LCD display and steering mounted controls also enables networking with mobile devices via Bluetooth and rear camera display capable. The integral safety concept from Hyundai combines together all active and passive safety components into a well knitted system - for the safety of the vehicle occupants and other road users. All new Elantra expands the already comprehensive list of available active and passive safety equipment by introducing new segment unique technologies. The body of the 2015 Elantra meets the most stringent requirements and in combination with highly efficient restraint systems, ensures the maximum possible protection for vehicle occupants. The 2015 Elantra will be available in 06 premium colours.